Darkestrah caught my attention a few years ago with their excellent album The Great Silk Road. 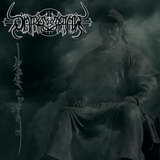 The mere fact that this atmospheric epic black metal band originally began in Kyrgyzstan would have been worth exploring it alone, but the music on The Great Silk Road proved that Darkestrah can attract with more than their exotic place of birth. Not sure if Khagan EP is a stopover of sorts, the prelude to the new full-length, but it is the first work by the band since The Great Silk Road. Given the story and the subject matter, Khagan, may also be considered a total standalone complete piece, even though it is only 3 tracks slightly over 23 min long. As if answering some of the (unwarranted) criticisms from the reviews I read later about The Great Silk Road, Darkestrah did expunge some of the woven softer, tender fabric present on that earlier album. On the other hand, writing music about Temudgin, the real name of Chinghiz Khan, one ought to begin the saga with the angry wave of varying tempos blasts and desperate shrieking voice of female singer Kriegtalith. The voices on Saga of Temudgin do get a little cleaner around 3 min and, along with the music, conjure up the feeling of both pride and violence depicting the life in Mongol steppe, at the time when the great Mongol empire was born. The aggressive battling music comes to a sudden crushing end with an unexpected, and rather ill-placed, folk acoustic insert. The entrancing epic feel picks back up around 7:50, but is surprisingly short, cut off by the track’s end, without allowing the riffs to come to their complete conclusion. The finale title track is another piece of solid, even if not soaring, melodic black metal, cut up again by a dark acoustic break, with the more somber mysterious and symphonic approach, including some string arrangements, taking over in the end. As much as I am a fan of melody and acoustic buildups in folk-oriented black metal, those sudden, out of nowhere, pop-ins on Khagan do nothing but distract and break up the flow, not to mention that the full folk instrumental Onon River is way too long for Darkestrah’s aboriginal 3-string folk instrument and adds little to the EP. All in all, Khagan had the potential to be a stunning fulsome EP, but instead comes off incomplete, stuffed with random songwritten pieces, giving a feel of overture with the entire story not being told. Even then, Khagan lacks in the category of truly vivid and captivating riffs, which were worth repeating over and over on The Great Silk Road. Being a history buff, I have read a ton on Chinghiz Khan and his son Batu Kahn, and my mind had to create stories from the written history to fit with the music, rather than the music on Khagan creating those pictures for me.